Left-to-right: The first two birds are Western Wood-Pewees, (Contopus sordidulus) and the second two birds are Eastern Wood-Pewees (Contopus virens). Originally all Perot Museum specimens were believed to be Eastern Wood-Pewees. 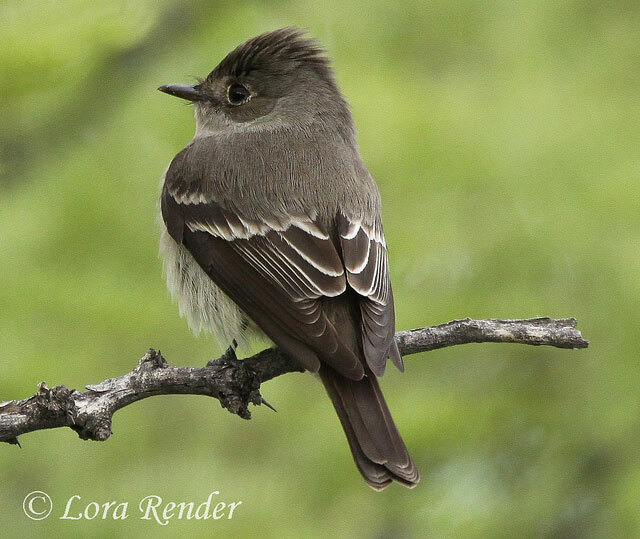 Field identification by sight is notoriously difficult between the two species, and there was no reason to suspect Western Wood-Pewee from North-central Texas since there were no prior accepted records. However, while Pulich was researching his manuscript in the late 1980s, he thought at least two of the birds required closer examination. He sent two of the birds to the U.S. National Museum for confirmation. These birds came back as Western Wood-Pewees, One (DMNH 4866) was from Tarrant County, 1954, and one (DMNH 5035) was from Young County, 1956. Both were taken in the month of August. Strangely, there are no other specimens from North-central Texas. In fact, there are no known sight observations from North-central Texas before or after these birds were taken. These two specimens remain the only known record for North-central Texas as outlined on the area map (as of 2015). Field identification rests largely on the the color of the lower mandible. Eastern Wood-Pewees show a mostly yellowish lower mandible while Western Wood-Pewees show a mostly dark lower mandible. This is best illustrated in the image below. The two Western Wood-Pewees on the left show a mostly dark grayish lower mandible while the two Eastern Wood-Pewees on the right show a mostly yellowish lower mandible. While all of these birds were almost 60 years old at the time of the photograph, the pewees here have retained this identifiable characteristic. Status and Distribution for North-central Texas - Eastern Wood-Pewees migrate through the area in good numbers and are uncommon local summer residents.